Synopsis: It has been over a thousand years since the last Realm War, when the angelic seraph and their dragon allies banished the demonic shedom back to the Realm of Darkness. Now a new evil threatens the Middle Realm as a self-proclaimed wizard and a mysterious black knight lead an army of savage reptiles against the kingdoms of man. To save her home, Princess Terrwyn will join her twin brother Erec and little sister Taite on a desperate quest to find Dracengard, a mythical place that few believe even exists. Princess Ashleen must lead an elite military order of Paladin to Dracengard to destroy the Wizard and prove that she is worthy of becoming the first woman to ever rule the White Fortress. The eight Kingdoms and their ruling families are torn apart as sides are chosen for the coming Realm War. Our heroes must overcome lies and betrayal, man-eating monsters, demonic knights, and opportunistic pirates as they flee the Wizard's clutches with magical stones that legend claims hold the power to destroy the forces of darkness. About the Author: Christopher Vale is a lucky husband to a gorgeous woman, a proud father to three wonderful little boys, a salty old Marine sergeant and a geek who will read anything about spaceships, dragons or superheroes. 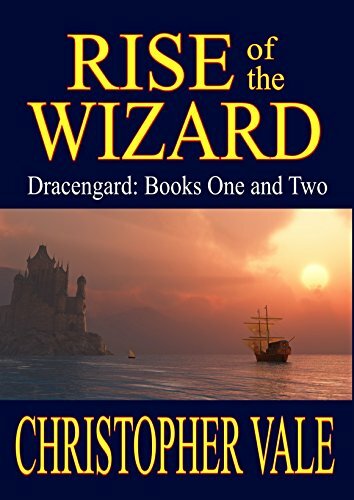 Chris loves to write and published his debut novel, Dracengard: Book One, in 2014.
Review: My biggest complaint is that I finished this book much too quickly (I literally could not put this down and may have stayed up much longer than I planned to finish it!). I can't wait to dive into the next one in the series. Christopher has clearly mastered the art of drawing readers in and keeping them reading. A fantasy epic that is sure to become a classic, Rise of the Wizard has heroes you will want to adventure with and villains you will long to defeat. A must read for fantasy and adventure lovers.